In my travails lately, I’ve had a few conversations with different buddies about the difficulty of finding people to get out on adventures. Scheduling seems to be the biggest issue, made worse by the relatively small numbers of more-epic outdoors folk in the rural area where we live. Their words ring true for me–but the variability of my schedule gives a bit more flexibility. Even better, the two trips I’ve taken to the pacific northwest this spring have yielded an especially nice series of scheduling benefits: getting out to play with my sister, Beth. Some background is helpful: growing up, competition kept things somewhat rough between us. Two years of age gap keep us close enough to make a constant friction, to the point that our mother tells a story of pouring out juice in a measuring cup to satisfy that neither was getting more than the other. Scrabble, when we both play, is a blood sport. At one point in my early teens, I told her that snowboarding “was going over to the dark side.” Naturally, she found things that weren’t the ones that I wanted to do: karate, showing horses for a number of years, and eventually finding a passion for theater tech that now informs her job as a commercial lighting salesperson in Seattle. The moment I left for college in 2007, the antipathy between us disappeared almost overnight. Physical distance seemed to erase the need to compete with each other under the same roof, and though I’ll admit it took me a couple months to realize what was going on, it was a new era of mutual affection. It bums me out now to look back on all the years that I let petty competition steer my emotions elsewhere. True sibling respect is an amazing thing. It was some level of factor in Beth heading to PLU after me. But it wasn’t until she took up indoor bouldering in her third year that we were doing the same active things. Later, she started climbing on ropes too. For her graduation present last spring, we gave Rainier a shot. Bike commuting twenty to thirty miles a day in Seattle, plus climbing four days a week, has tapped the same endurance genes that I make use of. She’s damn fast in the hills. I can’t even hope to keep up on a bike. Another era has started in our siblingship: outdoor buddies. The three trips in this post are a celebration of the fact that I’m a lucky dude–I get to spend family time out in the vertical world. 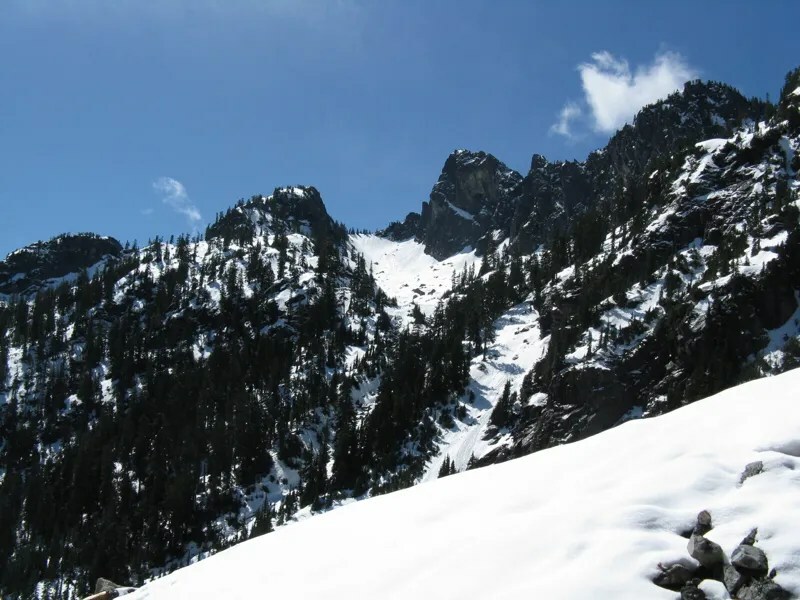 Our first adventure this spring was on The Tooth, a four pitch alpine trad route (5.4-5.7) on Snoqualmie Pass. This happened during an off day of my Volcanic Activity tour. Beth has been leading in the mid 5.10s outside and in the upper 5.11s indoors, so the climbing was cake for her. With summer planning looming, I wanted to get out and see how she did with being an efficient rope team while trying to push our way up some multipitch trad. April 27th was the date we went. 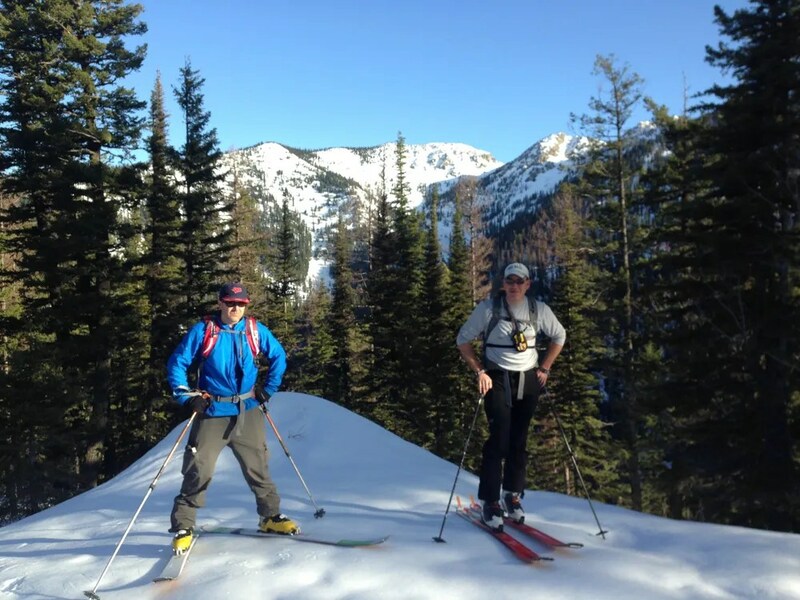 Snoqualmie Pass was barely open this winter for skiing, but even still, it felt too early. Rain had fallen the night before. Trip reports, though plentiful, didn’t seem too helpful what the approach was, exactly. My favorite includes this phrase: ” beautiful super-redundant nuclear blast proof rappel anchors located every 30 feet down the Tooth.” Which seemed positive. Either way, Steve had lent us his trad rack (thank you kind sir!) and we wanted to make it happen. And with that, we were up top. We’d moved quick, climbed well, and had it all to ourselves. 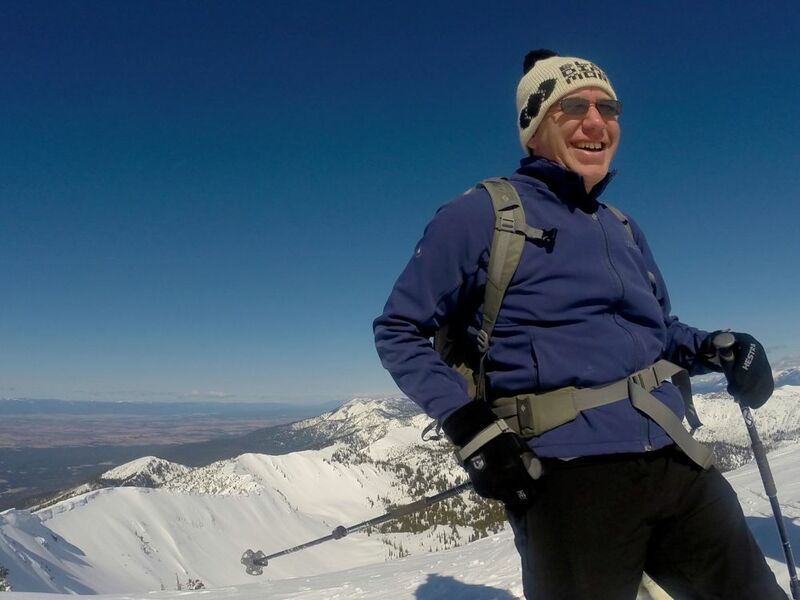 Really fun–I think my concentration on taking the selfie murdered my smile. Bigger fish to fry later: Then, we rapped off. I’ve found that the easier trad climbing I’ve done is actually the worst to rappel, since it’s not overhanging or even vertical. I was forced to punt the rope down over and over again through the shelves. 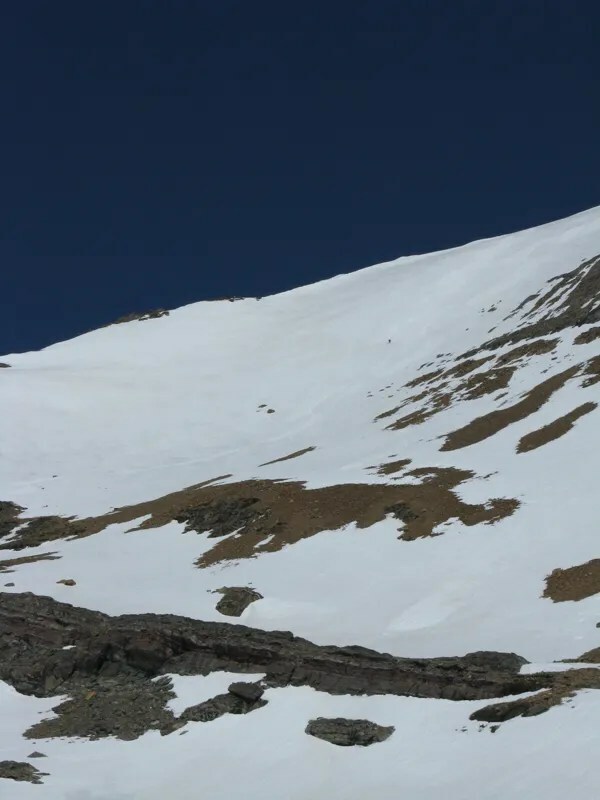 To avoid snags, we rapped four times to where we started climbing, then twice more down the snow couloir to save the strange scramble around the gendarme. 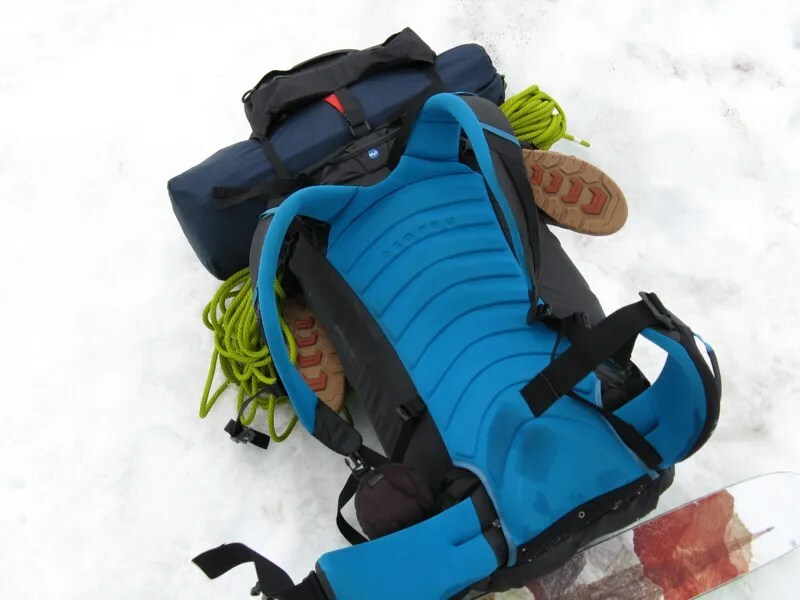 If you’re going, note that the second rap station in the snow couloir is on climbers’/rappellers’ left against the couloir wall and has multiple slings. After that, we crawled our way back through the mush, then down the trail. It had been a really awesome day, Beth had crushed it with her follows and pulling gear. Her skills make me really excited to get out more this summer when she’s not busy with all her friends that are getting married. 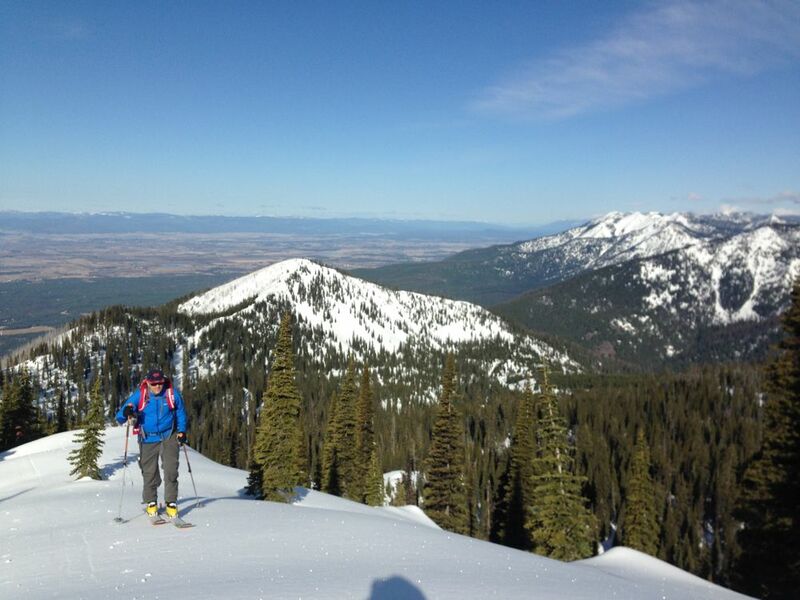 Over Mother’s Day weekend, Beth and her manfriend Matt made it back to Kalispell on a mad dash from Seattle. 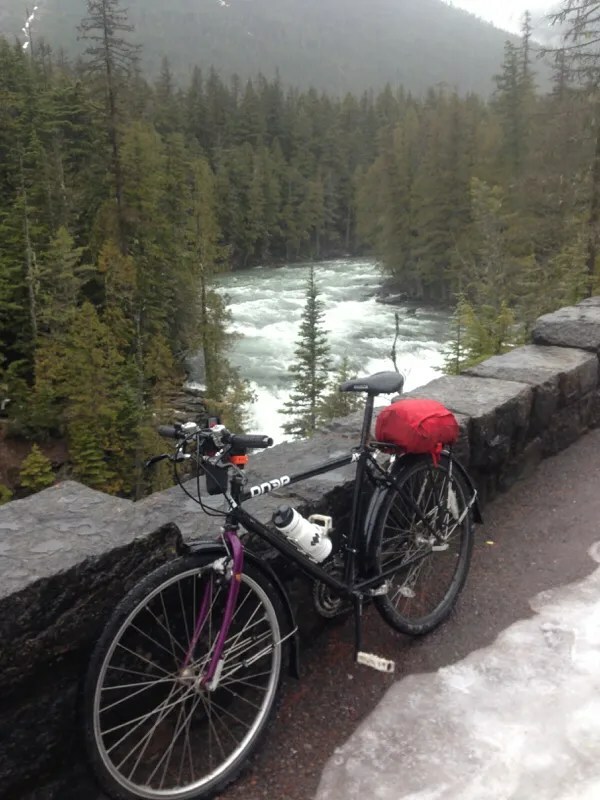 They rolled in late, then we all packed into my grandparents’ pickup with four bikes for proper Mothers’ Day festivities with a ride up the Going To the Sun road. To be honest, I didn’t take much in the way of pictures because I was chasing Beth’s furious pace up the road. She puppy-dog’d the other three of us on the way up the Loop, and after I caught up and tried to hang on as she powered up the steep grade. Elevation and continued steepness aren’t what she deals with while bike commuting. Bicycling in general isn’t my forte. Lactic acid burned in my thighs and I repeatedly told my legs to shut up as we fairly flew up the road. Maybe she was just being polite in that she didn’t dust me. Either way, we made the top in time for another sibling shot. It’s good to be humbled by your younger sister, but even better to see her so excelling at something athletic that she enjoys. I just hope she waits for me when she really becomes an athletic mountain terror and I’m panting in her wake. As my mom does now, maybe I’ll be able to take a little bit of credit for helping to get her there. As I mentioned earlier, we gave Rainier a go last spring. 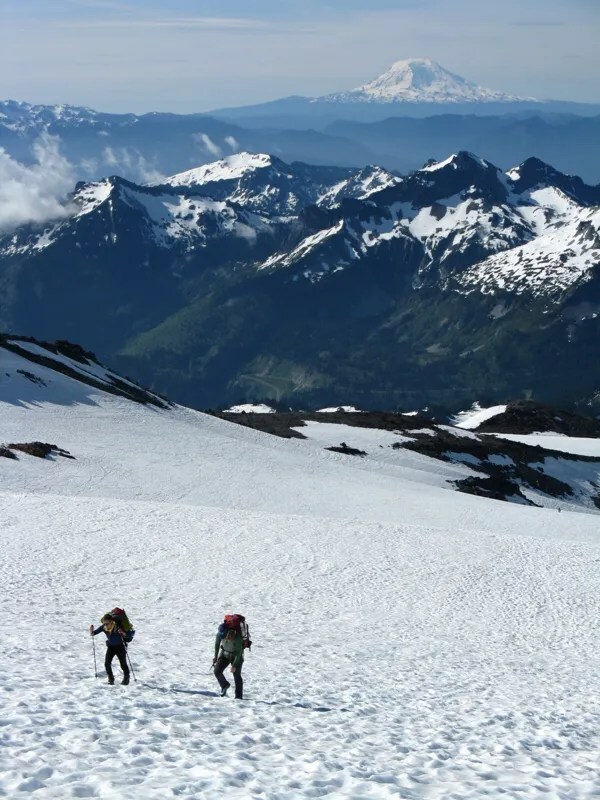 Due to my inexperience leading and planning, and a general lack of experience with big packs, that trip didn’t get past Camp Muir. So I said we’d give it another try this spring. My initial trip to the PNW this spring didn’t see that attempt. Beth texted to say that she had a weather window, I hemmed and hawed a little, and then committed, seeing other possibilities for after our climb. As I did when some friends and I skied Rainier in March, my trip over detoured through Yakima, White Pass, and then to Paradise. I camped in the parking lot Thursday night, and went in to get our walk-up permit for Muir on Saturday. Folks at the Climbing Information Center were supremely helpful both on the phone and also in person–thanks to them for route advice and their friendly demeanor. I walked out with our permit, climbing passes for Beth and Andy, a college friend of hers that would be accompanying us, and blue bags. Then, I hopped in the car for Seattle, shopped for food and other essentials at Feathered Friends, bought some trad gear on a steal from Rob (thanks! ), and hopped in Beth’s car to head back down to Paradise. I’ll explain in a minute. Details on Rainier climbing, in case you’re curious: A climbing pass ($45/$32 for ages 25+/<24) is required for anyone going above 10,000ft. You need to register for your climb, and during the offseason from Labor Day to Memorial Day, you can self register. 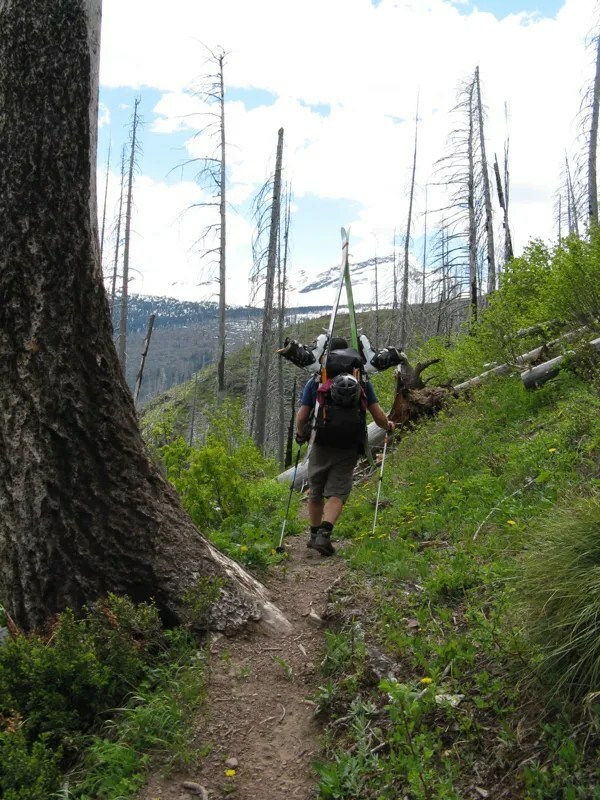 If spending the night out, you’ll also need a backcountry camping permit, which you can reserve, or also pick up as a walkup if the prior reservation window has ended. 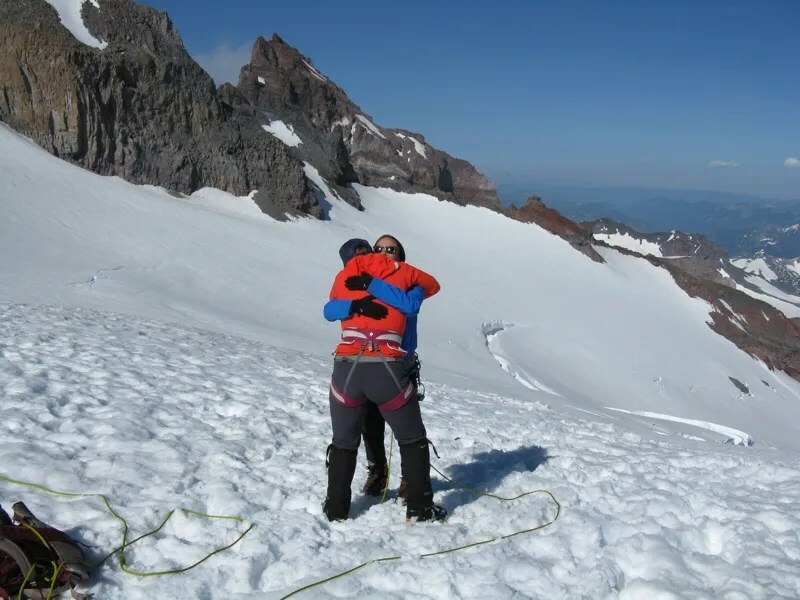 Rainier’s climbing rangers have always been helpful, and they run the best kept NPS climbing info blog I’ve seen, with good posts on current route conditions. 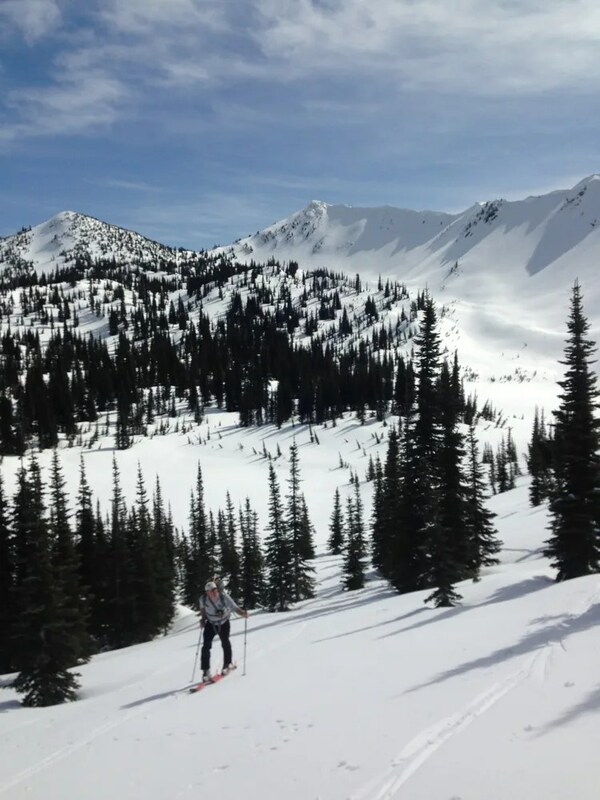 First timers typically take the Disappointment Cleaver or Emmons Glacier routes. Back to our trip. 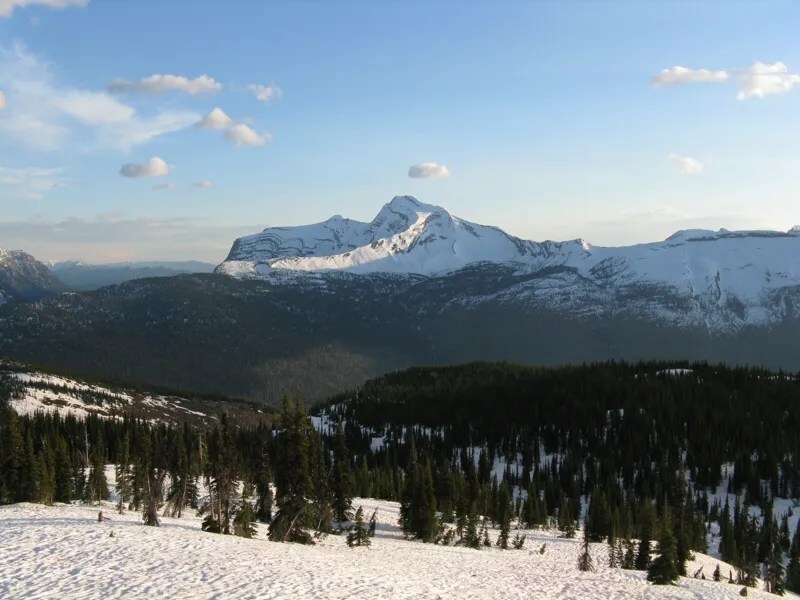 Rainier poses a big elevation risk for folks living at low elevations, like nearly everything nearby, because they end up gaining nearly 14,000ft over a period of a few days. HACE and HAPE are a concern, plus exhaustion. A safe rule of thumb that I learned while in Alaska was to only move 1000ft of elevation for every night spent sleeping there. Essentially, if moving camp between say 11,000ft and 14,000ft, spend three nights at 11,000ft before bumping up. People can and do move much faster, and altitude affects everyone differently at different times, so I’m not sure how much that rule applies for quicker climbs like Rainier. 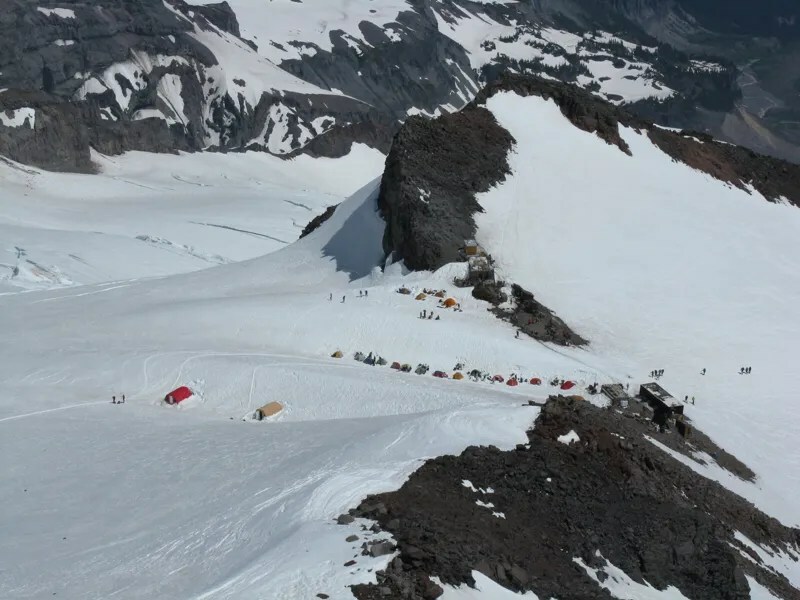 That said, I’ve found that sleeping at Paradise the night before beginning a climb on Rainier offers the benefit of 5000ft of gain before the trip even starts. Plus, it cuts out any driving–you’re there, and an early start is easy. Hence our return to Paradise from Seattle. We sorted gear, did a z-pulley demonstration, and fell asleep in anticipation of our early start. Beth and Andy all saddled up at 6am: I took skis, because the five grand of perfectly good skiing between Paradise and Camp Muir would be wasted if I walked. Beth and Andy moved along at a great pace. 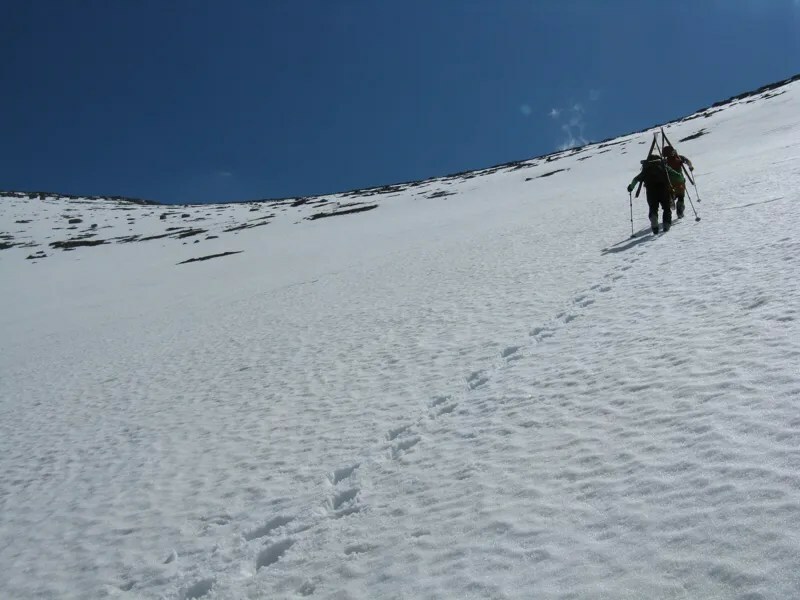 Once on the Muir snowfield, we took breaks every thousand feet. We were among the first to pull into Muir, arriving just after 11am. Beth and Andy had done really well staying hydrated with their packs and the steady, fast pace. Andy sported a headache, but both Beth and I felt great, which should be a tribute to learning a bit more and good genes. Another benefit of bringing your sister: Beth set the lunch bar high with smoked gouda, triscuts, and dates. She made me little delicious sandwiches of all three while I dug out a proper snow kitchen next to the tent. Remodeling at home is expensive and time consuming. But when you’re snow camping, you can build countertops, storage, seating, and windscreens wherever you please. I went out for a little ski lap above Muir, and snapped this picture. 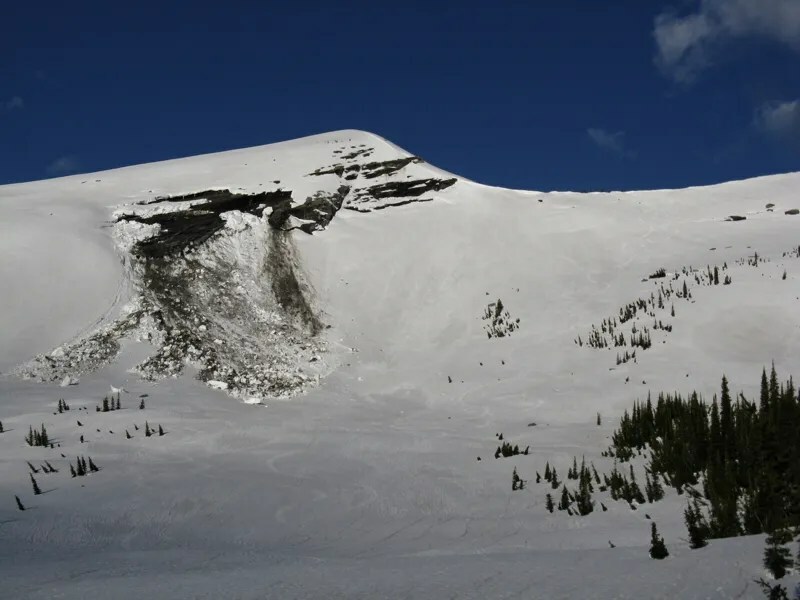 Since it was the weekend, the trail of mountain zombies stretched down the snowfield and camp quickly filled up with tents. Once back, I took a nap. 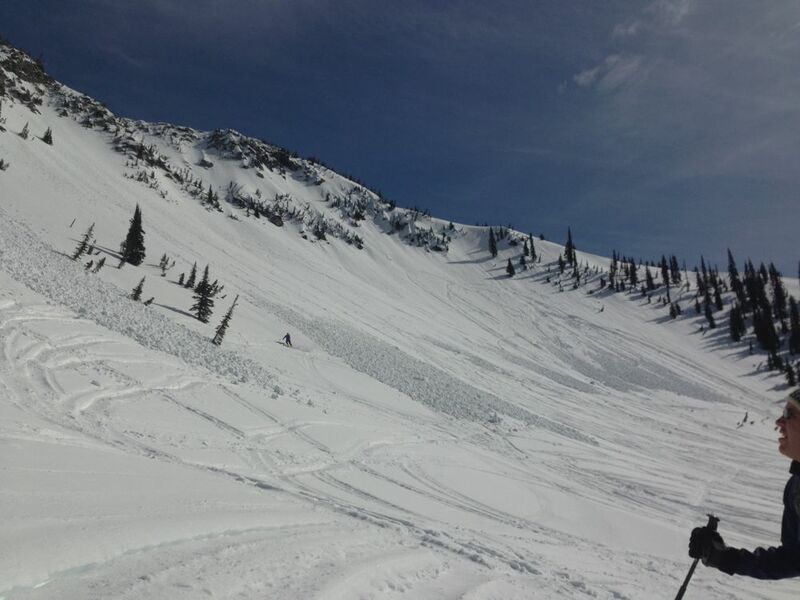 Then we dove into crevasse rescue practice on the snow rollover just out of camp. Demonstrating a z-pulley in the parking lot had helped clarify a few of the complicated bits. Andy served as ballast, and I demonstrated. Then Beth did it under my supervision. Then by herself, as I hung on the other side of the rope and thought about dinner. Andy, safely pulled out of the “crevasse” for the second time. 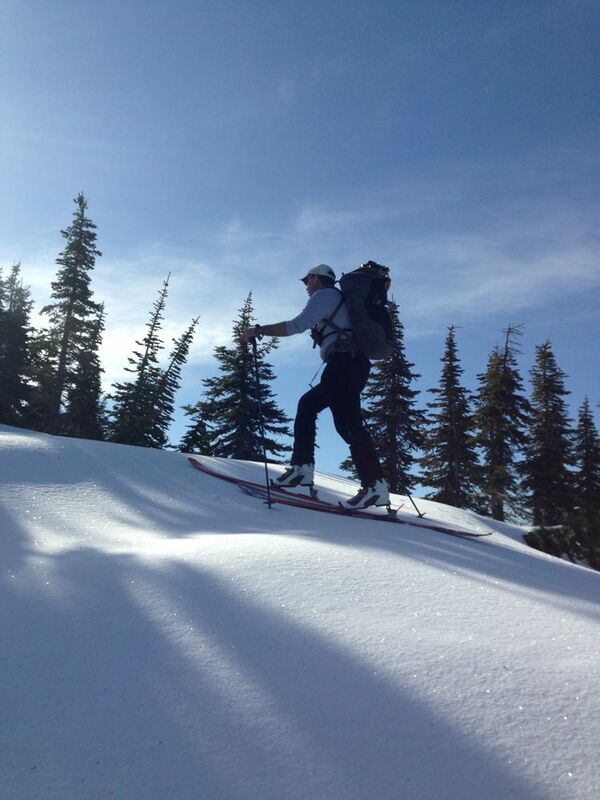 Andy, during dinner, decided that he wasn’t planning on accompanying us on our summit push the following morning. His headache remained, even after a bunch of water and a nap. That left Beth and I planning on waking up at 1am, out of camp by 2am. We crawled into our bags, and proceeded to eat a whole bar of chocolate between the three of us, giggling about the ridiculous words printed into each different square of the bar. 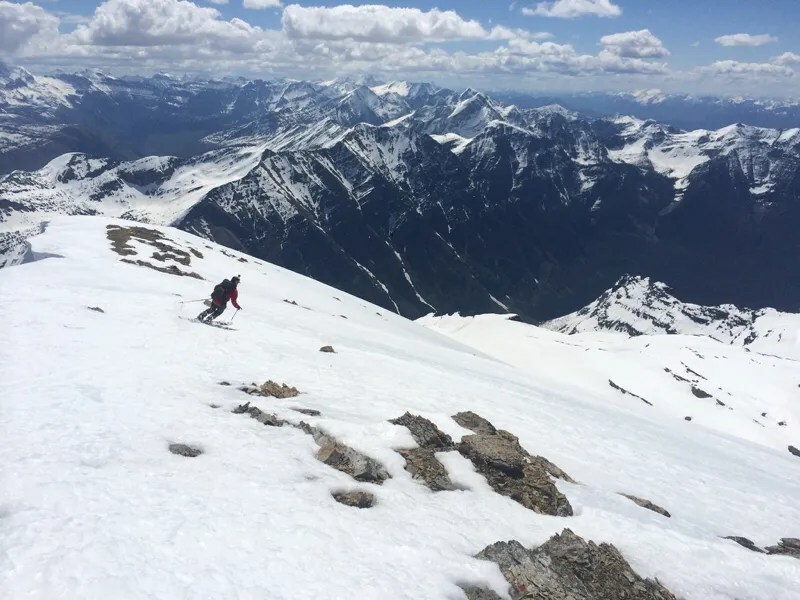 Mountain moments are like that: nerves or tiredness or the sheer tide of lunacy sweeps over a whole group of people together and you find yourself eating spicy, pop-rock, fine chocolate in a tent in the snow above 10,000ft. I hate that overused Kerouac quote about “the mad ones”, but lying there in my bag, it occurred to me that they’re the ones I truly understand and care for most. It didn’t bother me to retreat. We’d made it to 13,100ft, and fast. Things looked potentially grim. Sure, we’d worked hard and as always, it’s frustrating to fall short of the summit. 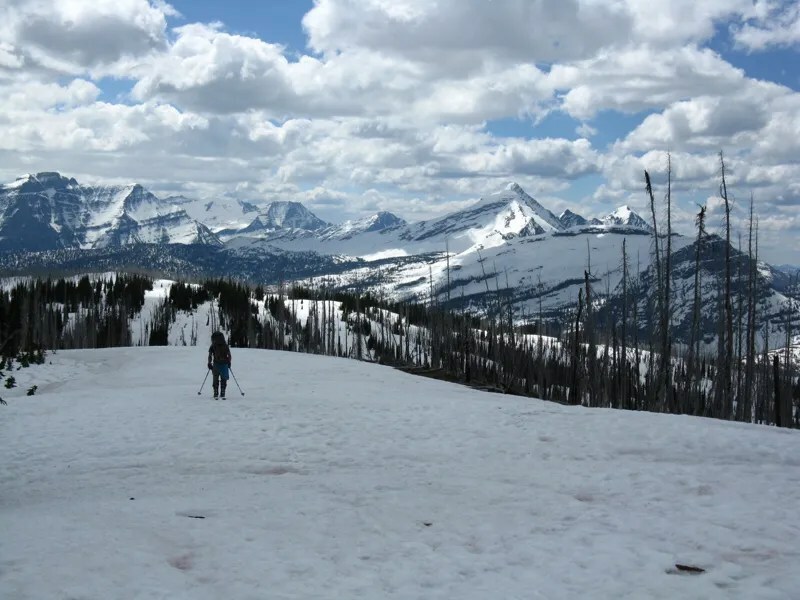 But to see Beth move to so confidently and well in that kind of terrain is the the type of thing that doesn’t require reaching an arbitrary point atop a big hill. Plus, the benefit of turning back there is that we can go and do it again next year. Hopefully the weather will be better, because I really want to pick out the Seattle skyline from the summit. 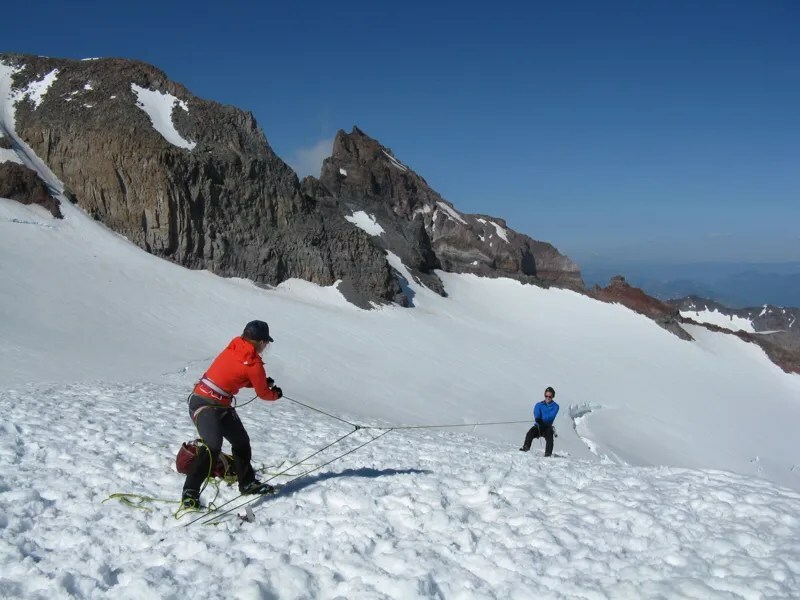 On our way through Ingraham Flats, we detoured to try and tie down a tent that wasn’t staked into the snow at all, but simply corded to the tent next to it. Each gust would flap it completely up in the air, only to set it down. Maybe we helped. You can see that the cloud had come down to the top of the Cleaver in this photo. All the way back to Seattle, we’d turn in our car seats to see if the cloud would lift–it never did, and that’s some consolation for our decision to turn back. Back in camp, we spent a while trying to find Andy, only to realize that he’d gone off for a little exploration on the rock buttress above camp. He was stoked to see us, and his headache was gone. We pulled camp, and they took off. I loaded up, and made turns all the way to Alta Vista before walking the rest of the way to the car. The snack spot at Paradise has a huge benefit compared with some of the other ones I’ve experienced: soft serve. It was 10am, I’d been up since 1am, and so it felt totally justified to be lying on a rock in my sandals, looking scruffy, waiting for Beth and Andy with my ice cream. Getting to do outdoor stuff with your family is a huge gift. Anyone who spends their time in the hills knows the amazing things that happen when you disappear into the lofty realm for a few days, and how the experience lingers on afterward. Infusing that into a familial bond is amazing. Sharing it with my sister is a tremendous honor, and just like the expanded ideas that come from my own experiences, there’s a shining future of climbs out there for us. Thanks to Matt for his care and driving late at night and belaying, Andy for accompanying us on Rainier, Steve for the rack, and most importantly my parents for giving me such a rad adventure buddy. Love you, Beth. Back in the third week of May, just after I returned home from the PNW, I found myself in the midst of a three part vortex of scheduling. Great weather had me all hopped up on any number of good ideas. Then, the details wouldn’t mesh. I had a couple days of misfires spent at home or taking a last-ditch afternoon trail run to make up for a perfect day more or less wasted. 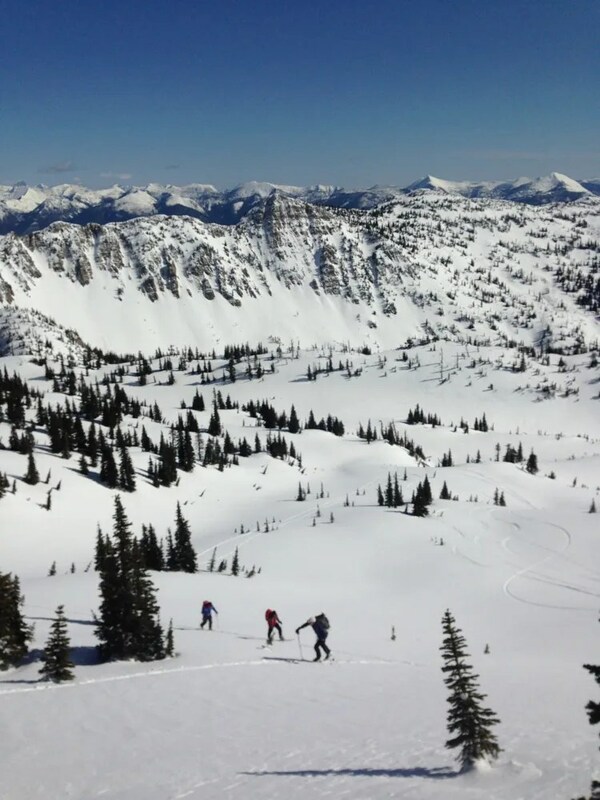 So when Ben suggested a three day trip to ski Vulture Peak, I was in. Then, I realized that some friends were going into Granite Park the last day of the three we’d planned. It seemed like I was going to bail on the Granite crew for the bigger, wilder trip. Then, I reconsidered. Since the trailheads were close, I’d be able to switch trips and stay out for three nights, four days. At the time, it occurred to me that the transition would be a little wild. But it was my chance to do both, rather than pick. And if you can have your trip and eat it too, why not walk a bit further? 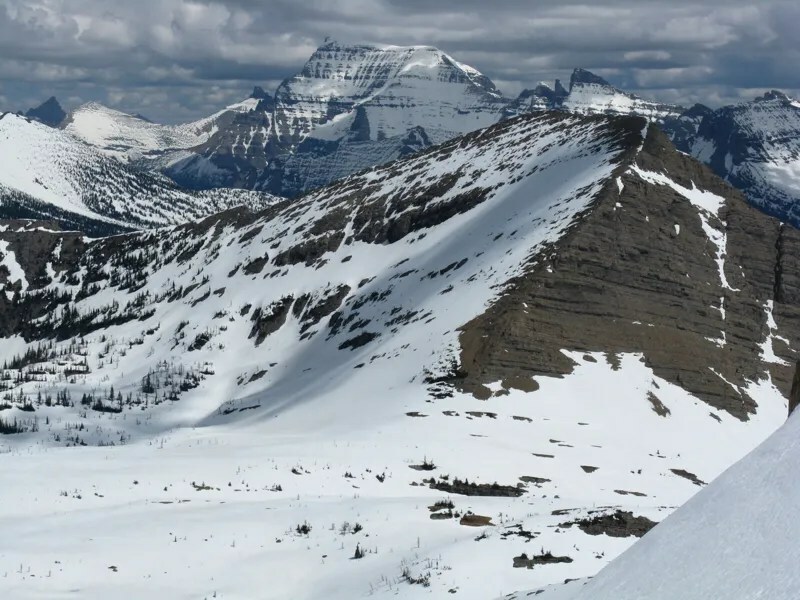 Vulture Peak, tucked away in the southern portion of what I consider the North Fork area of Glacier, offers three approach options full of bushwhacking. 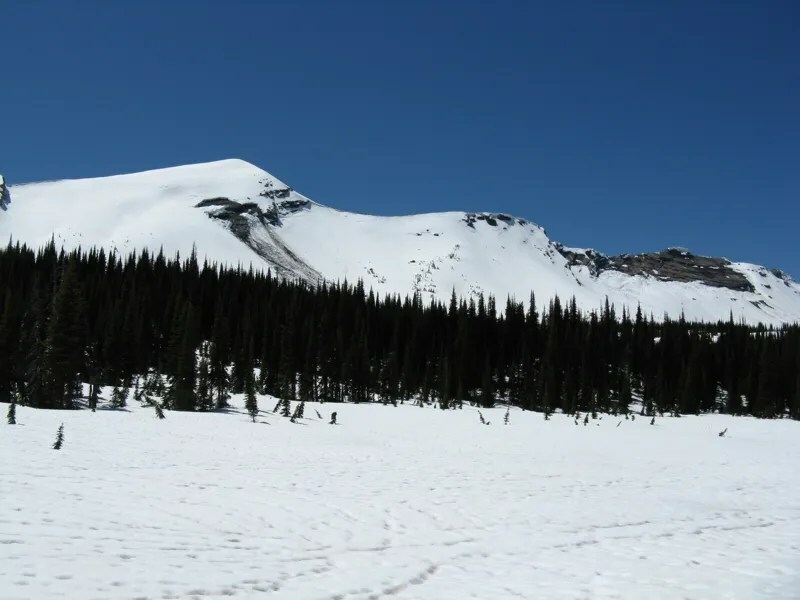 You can go in from Logging Lake, and brave the beaver ponds and scramble out of the sheer Grace Lake basin. Jefferson Pass to the north offers a long approach option as well. 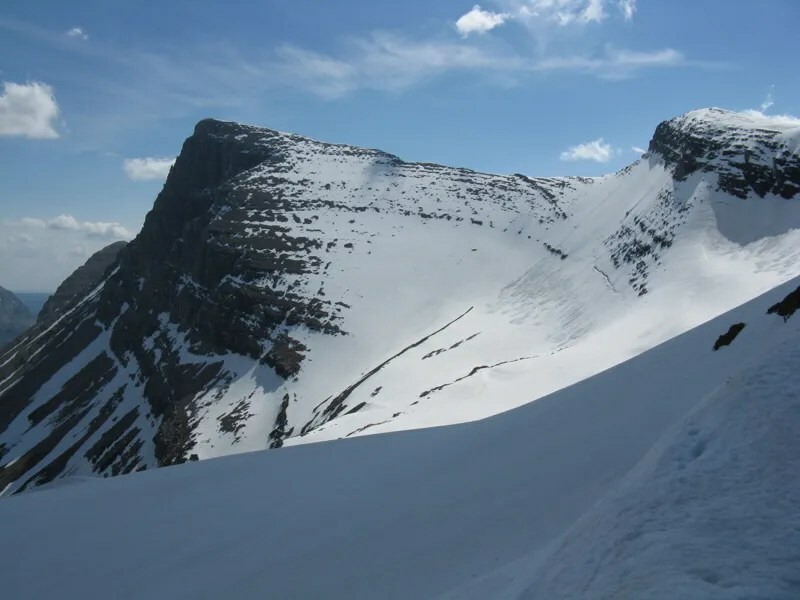 Our route, Packer’s Roost to Flattop Mtn to West Flattop to Trapper Peak to camp, seemed the best for the conditions: we’d take advantage of snow above the shrubberies, be able to ski more, and it would connect me closer to Granite after. 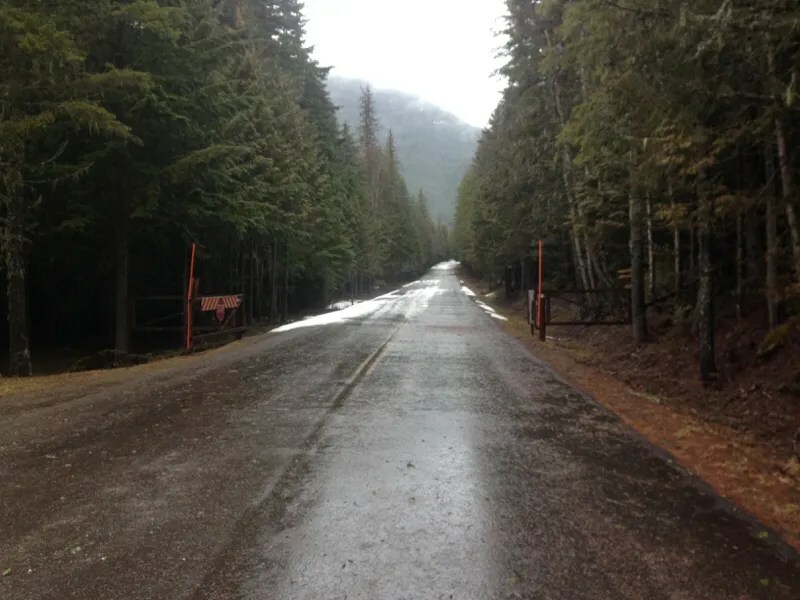 However, a couple factors made it worse: the road was gated at Avalanche, so we’d have to ride bikes for nearly seven miles before we’d even start the walk. The Mineral Creek bridge probably wasn’t in. In summer, it’s nearly twenty miles of walking to camp via the route we took. Skis would cut that down, but as we set off from Avalanche, our bikes loaded down, 4:30am on May 21st, I felt like the trip was off to a sufficiently insane start. It didn’t make sense to bring the food and clothes that I’d want at Granite all the way to Vulture and back, so I devised a genius cache method using a bear keg. Trouble was, the keg has no outside attachment points, which I can only assume it so keep it from being more easily handled by no less a creature than a bear. It toppled off my bike rack twice en route to Packer’s Roost, which didn’t even concern me as we stashed our bikes and started the walk, but would come back to haunt me two days later. Typical stream crossing etiquette is to unbuckle your bag in case you fall in. Given the moves we were making, it seemed like a loose bag would prove a bigger balance hazard. So they stayed ratcheted on. It’s a good thing none of us toppled in. From there, the Flattop Mountain trail climbs up switchbacks along a nice gorge with a waterfall. Somewhere about the 5500ft mark, we ran into snow. Morning air made for solid walking, so we booted for a while before switching to skis somewhere past the Flattop Mountain campground. We then had some decisions to make. The trail continues across Flattop, eventually dumping you out at Fifty Mountain campground. On the map, it seemed to make a nice, even line across. 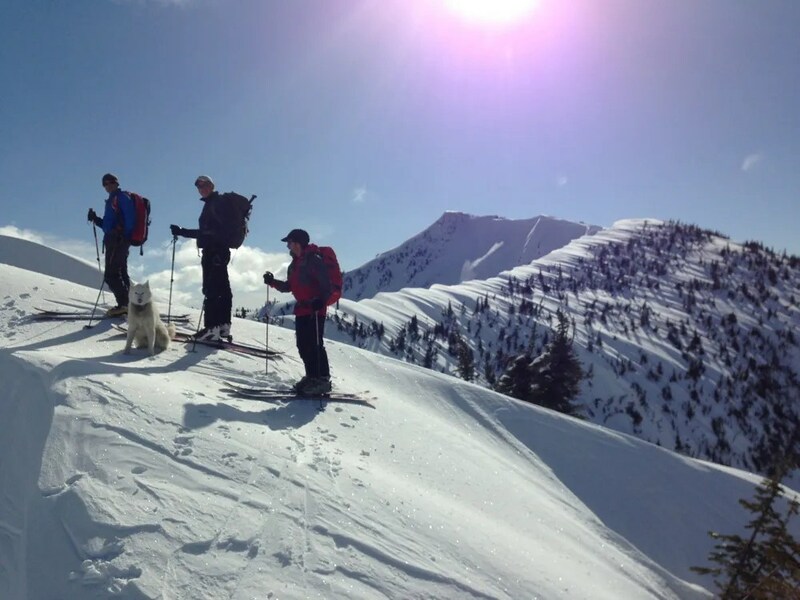 But ski touring is different, because the opportunity to take advantage of gravity can cut a lot of effort out of traversing cross country. 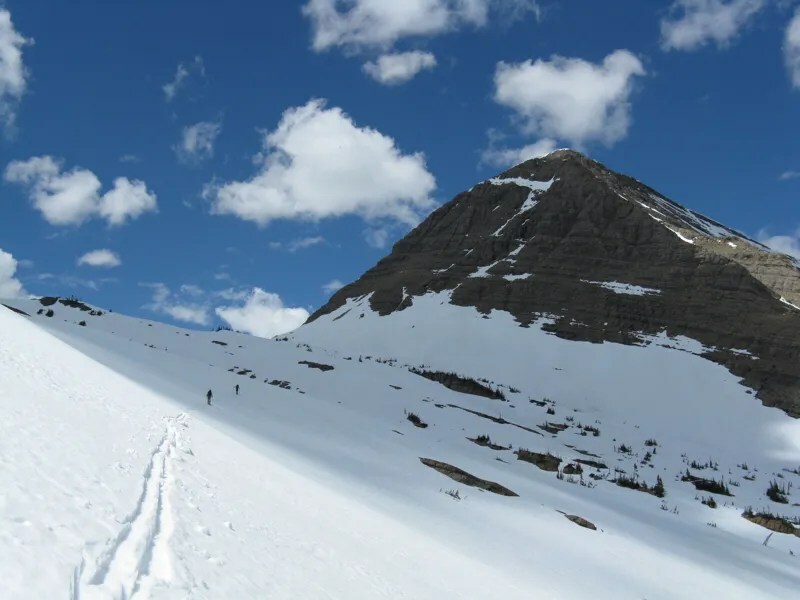 We ditched the trail, electing to head up to the summit of Flattop, then ripped skins and used the downhill to cover a few miles of contouring on the west side. 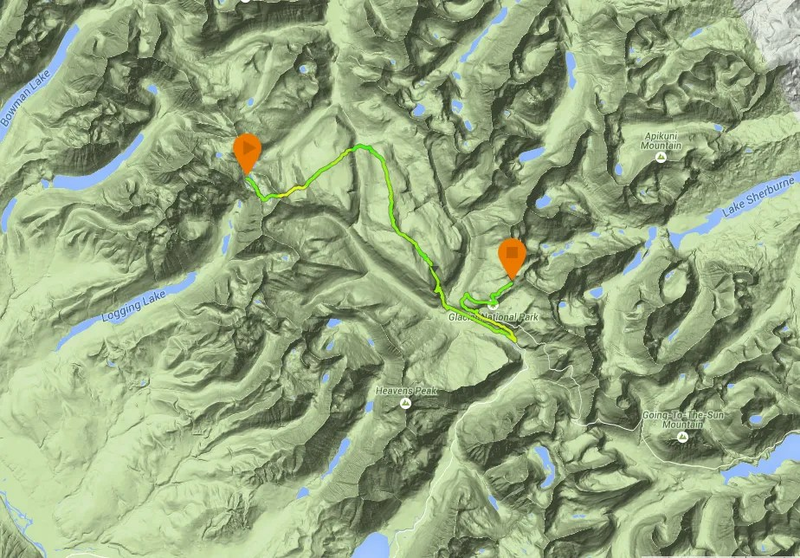 The aim was to find a way to get down to Continental Creek and cross. Ben drops in on a wind-drifted gully that took us perhaps half the way down. As you can see, Ben did solid work on his tan this trip. More on that later. 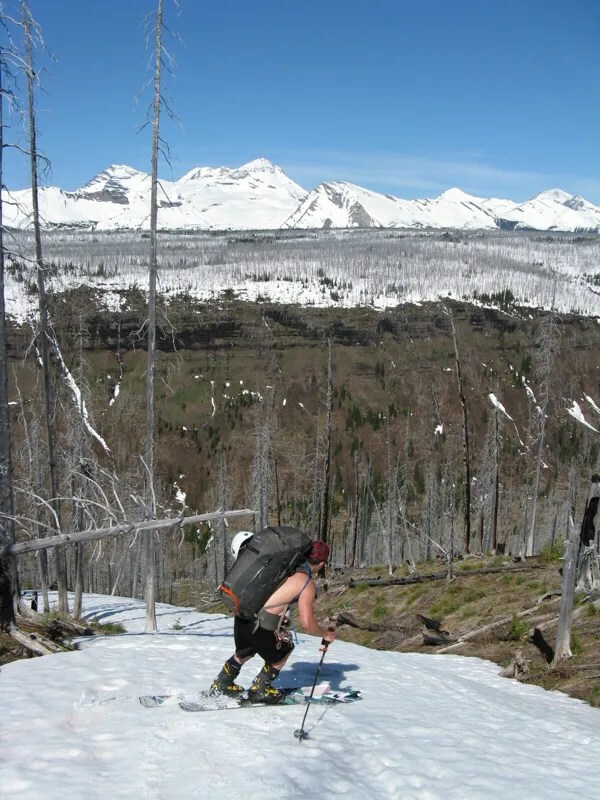 Shrubs and dirt forced our skis back onto our packs, we dropped to valley bottom, and bushwhacked up the other side. 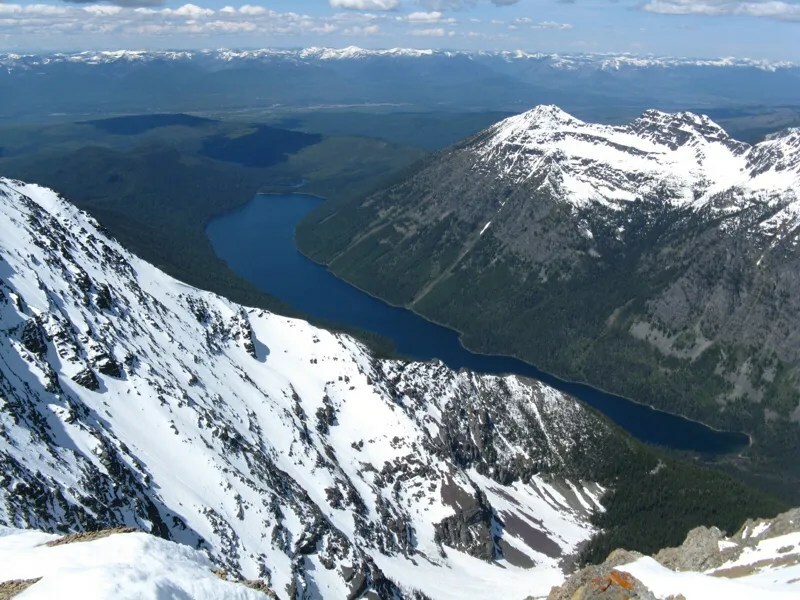 For future reference and route planning, it’s worth noting that the pass at the north end of the Continental Creek drainage is the highest point of the valley. So the further north you go, the less elevation you have to drop in the transition to West Flattop. There’s also a spectacular waterfall in there, on the southern end, probably well over 150ft high, that I’ve never seen photographed or heard about. Next time. 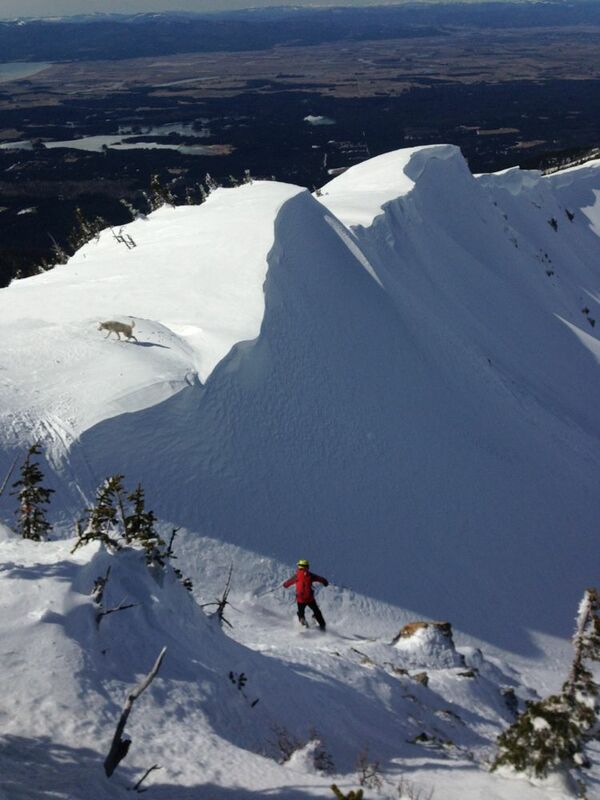 Once atop West Flattop, the skinning was easy. The tops really are quite flat, and go on further than you’d like. Trapper was our next objective, and we had to rip skins then put them back on because of a dip en route. On our return, we skied from the saddle to the right of the summit and debris. But to keep things easier with our overnight bags, the ridge to the left was our approach option. By this point, we’d done a lot of walking. I was feeling the pack, and the effort. Thankfully, the views, with the stark contrast of the snow line, were worth it. Zach and Ben making their way up with Flattop behind them. On the far right, below treeline, you can see the cut of the Going To The Sun Road on the Garden Wall. Vulture itself had been growing steadily larger all day. Atop Trapper, I got my first really good look at it. Red line was our descent the next day, with camp at the bottom of the line. Given that we didn’t want to ski ice, the morning was a casual start. 3400ft of gain with light packs felt like cake after the heavy long day of approach. I’ll admit: the summit didn’t feel like much compared to the day of approach, or the looming trip back out. 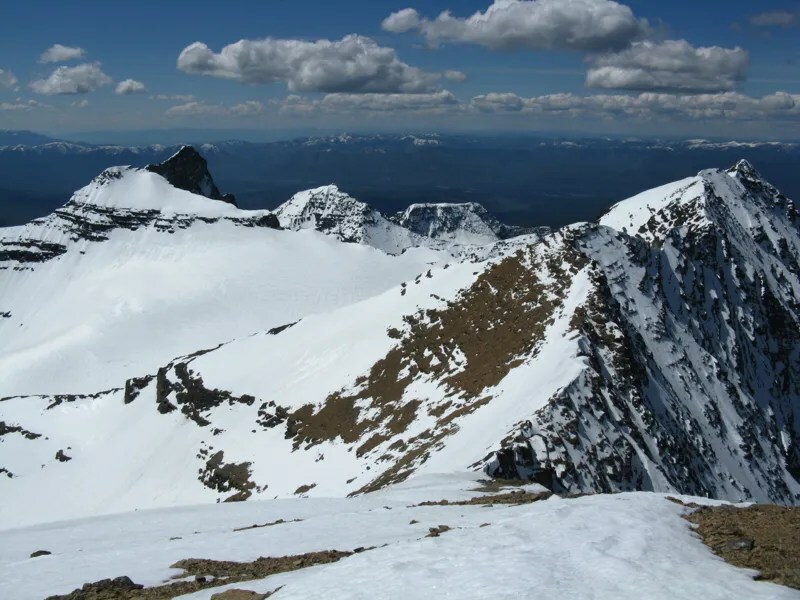 Really, many summits feel pretty dang similar: stratospheric, somewhat sparse and stark between blue sky, white snow, black rocks, with the wind blowing over it all. Of course, the view is always different. But for me, the summits themselves are increasingly less interesting compared with the company you have while you stand on them. 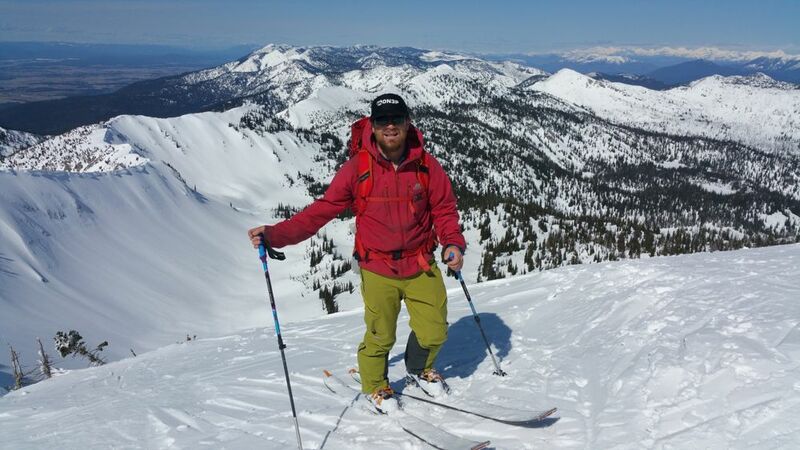 I’d spent only a day of inbounds skiing with Zach before, but got to know him way better while we were out there. Ben and I spent some time on Appistoki this spring, but again, three days out gives you some awesome time to see all of someone’s range of ability and emotion under the duress of a hot sun and a heavy pack. These are some seriously awesome gentlemen, and it was an honor to stand with them on such a remote summit. And as I mentioned, Ben kept working on his tan. He left with burn lines from both the backpack straps and his beacon harness, which I can only say made him look even more attractive. Looking over towards the South Vulture summit. Then, we got to ski down. 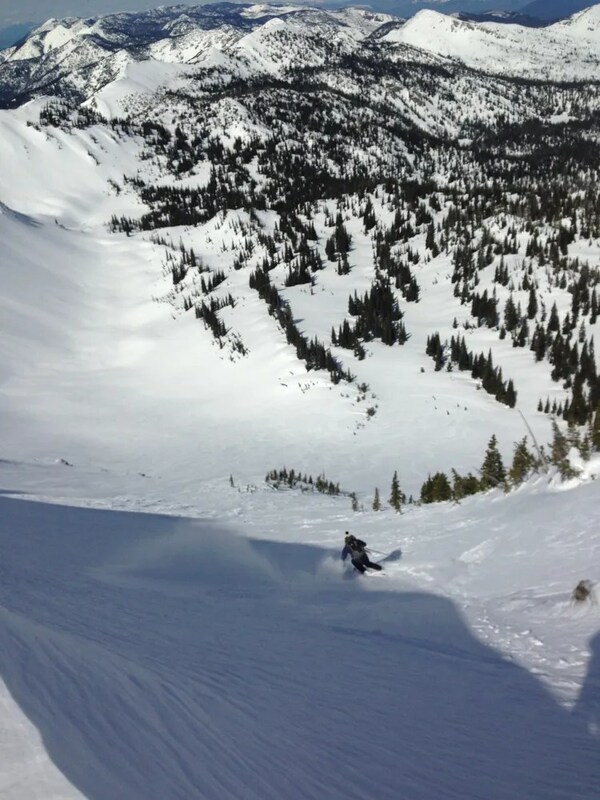 Thanks to Ben for grabbing this shot of me dropping in off the summit into the double rollover that ends in the Vulture glacier basin. Ben and Zach make their way down. Zach and Ben lead the way back out of camp after lunch. Looking back up towards Vulture during the mellow climb up the ridge of Nahsukin. Gyrfalcon Lake isn’t quite fishable yet. Summit creatures of Nahsukin. It’s worth noting that there is a summit register out there, and if you go, be sure to find and sign it. Descending the face was a mix of rock dodging, isothermal mush straightening, and making sure we didn’t end up over a cliff. That said, it was a damn sight better than walking back down, and we even enjoyed ourselves. A bit less high fiving and excitement than Vulture though. Afternoon sun had cooked the traverse back to camp, making it a slow affair. However, this has to be one the prettiest places to be moving slowly. Zach makes a turn or two on our way back to camp. Peak in the center is Trapper. Dinner for me was some random mix of curry and whatever else I brought. Zach and Ben created a mix of macaroni, hot sauce, ramen spice packets, and instant potatoes that really did taste pretty good. Important phrases like “special cheese sauce” were repeated, to much hilarity, and it seemed like we’d been out a good deal longer only two days. We dug some walls for the tent to prevent doom-by-wind in the night. I fell asleep thinking of the massive day to come. Up by 4, moving well by 5:30. Clearly, these are some stoked, sunburned guys. And our 6:45am turns down Trapper. Given the massive debris, I wouldn’t have wanted to ski this at any other time of day. Our early rise made it worth it though, because we got an inch of slush atop refrozen stability. Back across West Flattop. Across Continental Creek. 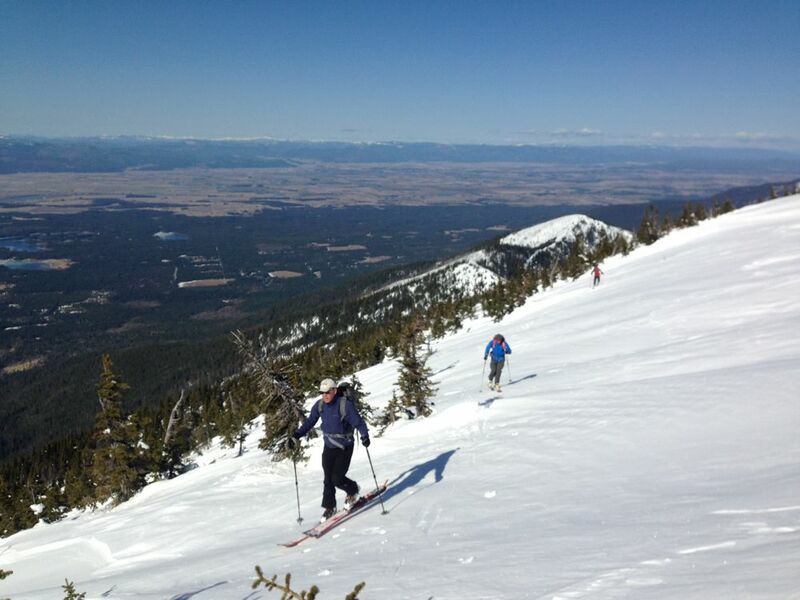 Up Flattop, and skiing down the south ridge from there towards the Flattop campground. It drug on. We were all tired by that point. The view into the Sperry Basin is terrific from up there too. Only from Heavens Peak have I see it so nicely before, so that’s cool. Somewhere before this shot, I’d eaten the last of my cold mashed potatoes, with only a bar remaining for food before I restocked at Packers. In my food there were some burritos, another mac n cheese, and all kinds of other delights. It was good motivation. Did I mention that we were tired? And it continued. Down Flattop, across the bridge cables again, and plowing through the downed timber to get on back. I tried to stay hydrated. My stomach grumbled. The same urgency that I’d had to get to food carried Ben and Zach along too. Once we reached Packers Roost, they grabbed their bikes, said their goodbyes, and headed out. I was all excited about the food in my bear keg, but upon opening it, realized that something had gone seriously wrong: a cloud of white gas vapors slammed into my face. It seems the extra bottle of stove fuel I’d stashed there had leaked, probably caused by the falls off my bike on the way in. Almost three days of marinating later, the stink made my dry clothes pungent. I couldn’t quite tell if it had gone through the plastic bags that housed my precious burritos and the caramel roll I’d brought for breakfast the next day. But I was ravenous. Smelling the burritos, they seemed ok. So I ate one, as it started to rain a bit. Once at the Loop, I stashed my bike, grabbed the white gas smelling food, put my skis on my pack, and started the final four miles/2500ft gain of my day. There were a few burps, after each I’d smell white gas. Which convinced me: the white gas had seeped through the plastic bags. In my hunger, I’d eaten some. Gross. My lunch for the next day was ruined. Hopefully the breakfast wasn’t. My food was three gels, three bars, and maybe a caramel roll. Perhaps the gents I was meeting up with would have some extra. But as usual, all the distance was worth it. Granite Park is probably the easiest-attained Best View in Glacier. The whole summer of 2012, when I worked at Granite, I stared at Vulture. It was nice to stare into the sunset and know I’d been over there only that morning. The next morning, I woke up pretty early. Hungry. Excited for my caramel roll. I got all situated, took a bite, and smelled white gas again. So my breakfast was hosed. I stuffed it back in my pack, muttering. Thankfully, the guys had overpacked a bit, and found some extra food to spare. 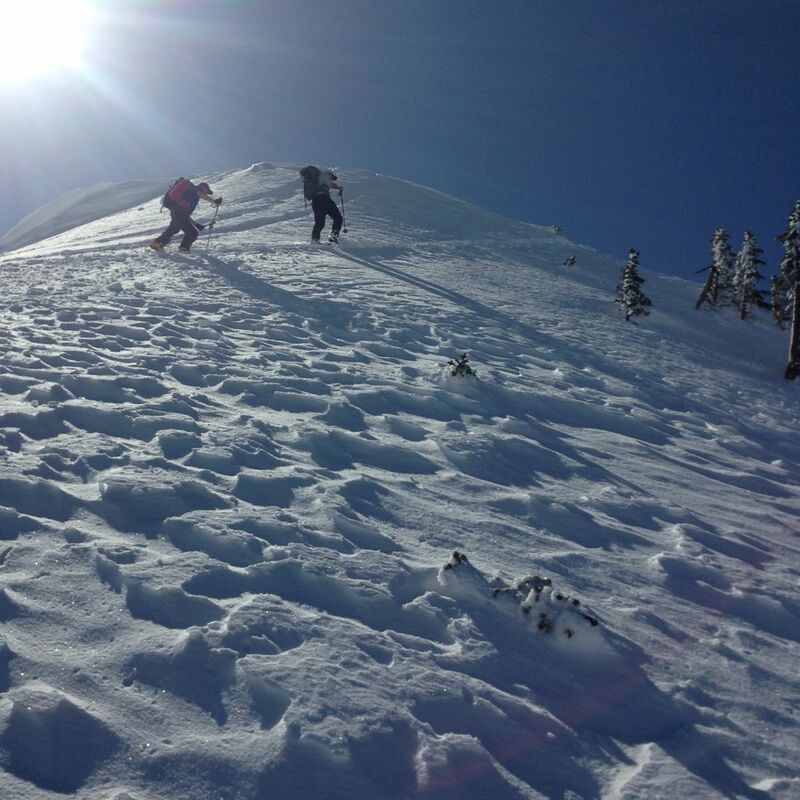 They saved my day with that, and it was a good thing, because our plan was to go and ski Grinnell Mountain. Zach, one of my coworkers on that Granite summer of 2012, had already been up there. For the rest, it was a new trip, and I’d never brought skis along. 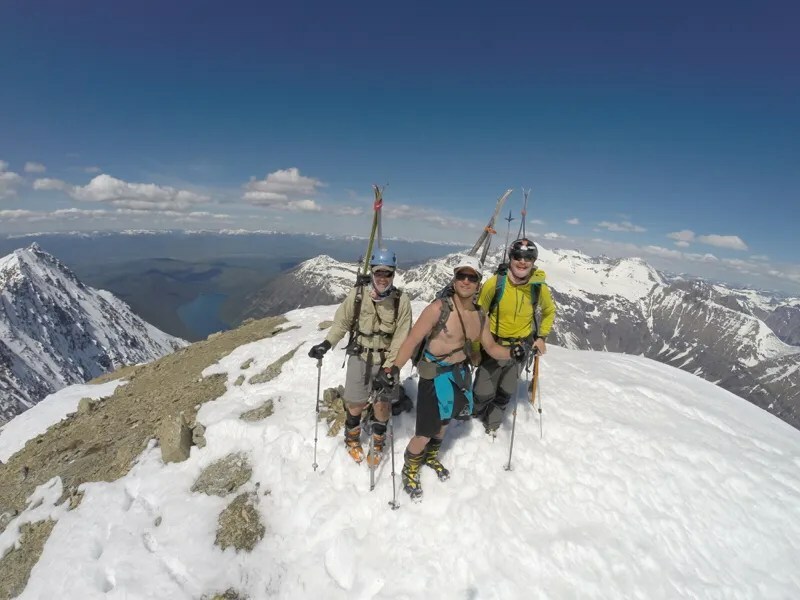 They elected to ski more towards the glacier basin, while I went up towards the summit and picked a line through the rocks. 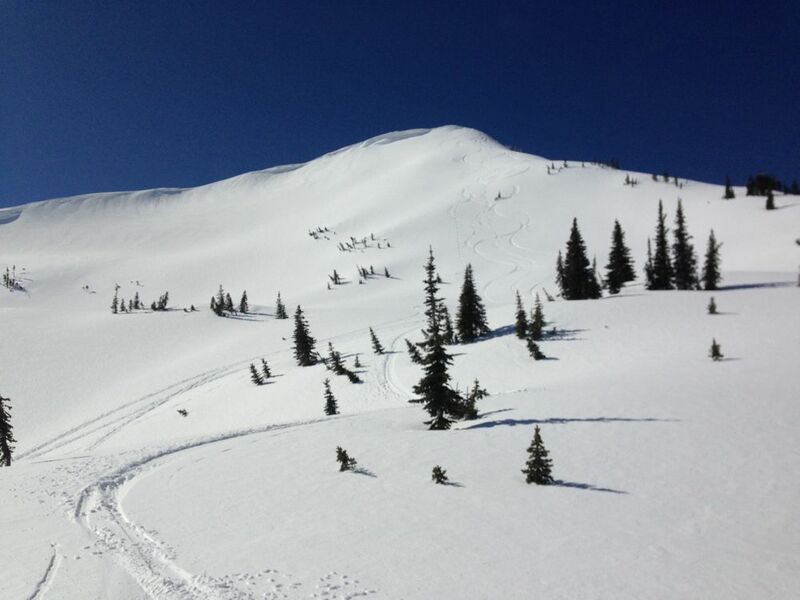 Northwest facing made for great turns unwrecked by morning sun. I got to watch all three of them shred down, and the stoke was high. As we walked back up to the divide for the quick ski back to Granite, I considered how cool it was to not only switch trips, but also get to see old friends and meet new ones twice in the same time out. The beauty in Glacier draws cool people, and the folks I’ve been able to meet doing all this hanging around here are salt of the earth. Another blessing to be counted. We then headed back down. It felt longer than it actually is. Despite more donated food from the gents, I was really hungry. So when we hit the Loop, I rerigged my gear and bolted for Avalanche. Thankfully, they hadn’t towed my car. Thankfully, I’d had the foresight to buy some snacks. Thankfully, some nice guy took our group picture. Somehow, they managed to pack all their gear and bikes into only one 4runner, and they headed off. I drove back home, thinking that it really had worked out pretty dang well to have my Vulture and eat Granite too. Maybe I’ll try this stuff more. Big thanks to Ben and Zach for the time on Vulture, Justin for hosting us at Field Camp prior to departure, Zach, Breyden, Will, and Sam for the good times at Granite, and the good people at Glacier National Park dispatch for handling my backcountry reservations for two separate trips while the actual backcountry office was in training. Note: all conditions current to April 20, 2015. 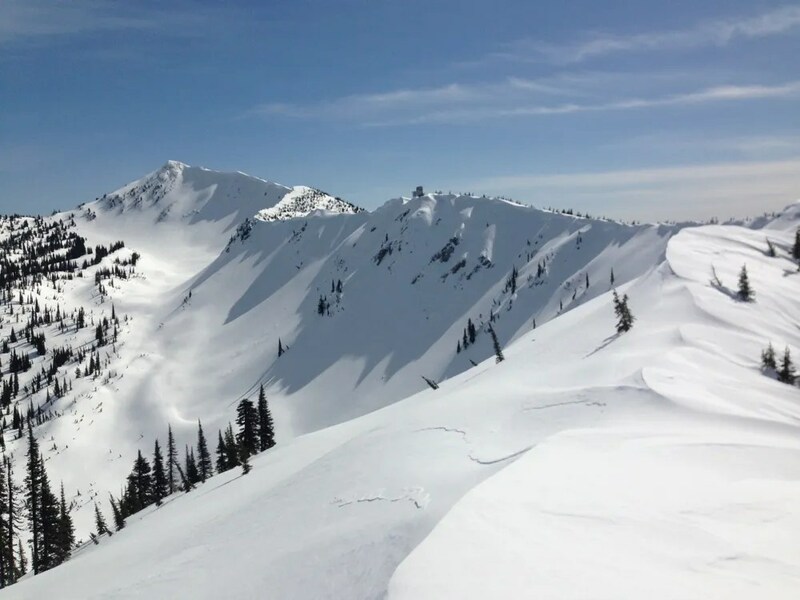 There’s much to be said for gnarly descents, untouched lines, and pushing the envelope in search of self discovery, untold riches, and the fawning accolades of battalions of internet followers. However, the truth about some days is simply that, even when everything goes completely to plan, they’re worthwhile but not because of any of the aforementioned qualities. St. Helens, via the standard route, is a standard sort of day. Made different in this case because of the extra approach work from a poor winter snowpack. But we walked, we skinned, we summited, and headed back down. I guess we got a little lost on the approach, but it wasn’t much to write home or blog or video about. So instead, I offer you this compilation video of the things I did find interesting, with more explanation below. Thing #1: Excessive morning motivation. Some people just wake up more easily and quickly than others. You guessed it–I’m one of those exceptionally annoying people who goes to sleep in a wink and bounces right back out of bed. Maybe Mike didn’t actually need coffee, but I’m still impressed with his Geiger counter reference at 5:30am. Thing #2: Dumb mountaineering jokes. Especially in the vacuum of context brought by a quick video. Thing #3: Seasonal flux. Winter route over tons of dry trail from a Sno-Park with no snow in sight. Then, it’s blazing hot up even on the upper parts of the mountain. Really not looking forward to climate change. Thing #5: Not falling over the cornice. Always hard to get a good read on where the edge does lie, so I probed hard to find it. Still didn’t feel comfy with getting close, so in a storm of Mike inspired inspiration, I put the go pro on the end of my avie probe. Insta-crane. Thing #6: Poor man’s drone. We then tried skiing with the Gopro on the avie probe. Worked better than I thought. Thing #7: We saw lots of people walking up and down. Which made me thankful for having skis, so I didn’t have to slog through the slop. Thing #8: Mike’s shirtless post-trip commentary, selectively edited. The eyes closed thing is hilarious to me. He should be an actor. Thanks to Mike for rallying down from Seattle, for his zealous company, and for the Cheezits he produced after we got back. So tasty.